Lewis Hamilton’s Mercedes boss says the Briton is “a class act” performing at the highest level as he closes on a fifth Formula 1 world title. Toto Wolff said Hamilton was “more complete than ever before”. “[He is] showing commanding performance in the car and challenging the entire team to perform to higher levels at the same time,” Wolff added. Hamilton will clinch the title at Sunday’s US Grand Prix if he wins and Sebastian Vettel finishes below second. Even if Hamilton does not win at the Circuit of the Americas, he will be champion if he outscores the Ferrari driver by eight points. Hamilton, 33, has taken six victories in the last seven races and heads to this weekend’s race in Austin, Texas, with a 67-point lead with only a maximum of 100 points available over the remaining four races this season. The British driver has won five of the six races held in Austin since the inaugural event in 2012 – one for McLaren in 2012, and the last four in a row for Mercedes. 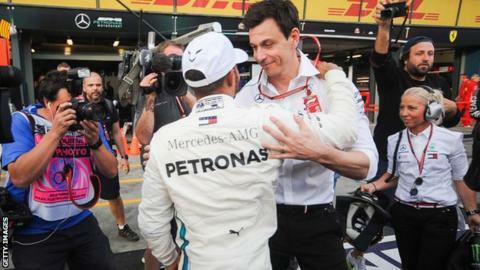 However, Wolff said the title battle was “far from over”. “The Circuit of the Americas has been a good track for us ever since it was introduced in the F1 calendar,” Wolff said. “But past results have no impact on the current championship. “Everyone in the team knows that we cannot take anything for granted, so we will be as diligent as ever, keep our heads down and work hard to get a good result in Texas. Wolff added: “While we didn’t have the fastest car in the summer, we’ve seen the performance swing in our favour recently. “However, it is closer than it looked in recent races. Ferrari have a strong car and they will keep on pushing until the very last corner in Abu Dhabi. Meanwhile, Stoffel Vandoorne, dropped by McLaren in Formula 1 for next season, is to drive for the Mercedes-affiliated HWA team in the all-electric Formula E championship starting in December. The Belgian will be team-mate to Briton Gary Paffett, who on Sunday won the DTM German Touring Car for Mercedes, the company’s last race in the series. HWA is serving in the forthcoming fifth season of Formula E as a forerunner to a full Mercedes factory entry in season six.